South Korean first lady Kim Jung-sook wrapped up her solo trip to India on Wednesday after celebrating a memorial park for a legendary queen and promoting cultural ties between the two nations. Kim embarked on a four-day trip to India at the invitation of Indian Prime Minister Narendra Modi to attend the groundbreaking ceremony of a park commemorating Heo Hwang-ok, a legendary Indian-born wife of Kim Su-ro, the founding king of Korea's Gaya Kingdom (AD 42-562). During the visit, Kim met with Modi to discuss ways to enhance cultural relations between the two nations, and attended a lighting ceremony for India's Diwali festival of lights. 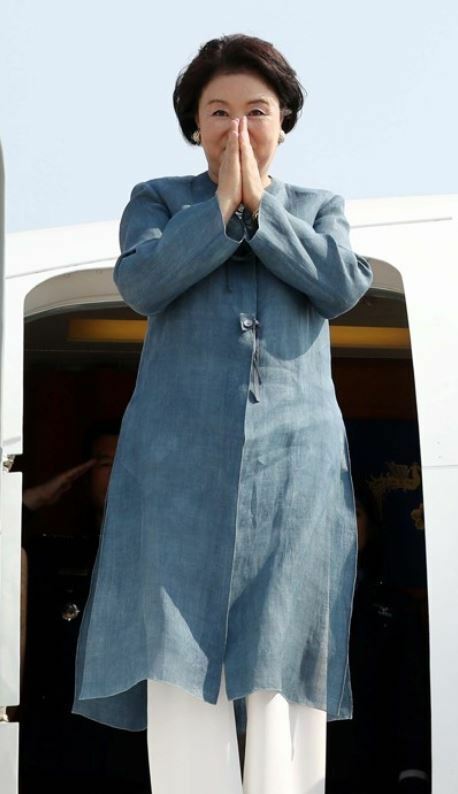 "It is a matter of immense joy and pride that Mrs. Kim Jung-sook, First Lady of the Republic of Korea visited Ayodhya and also wore traditional Indian clothing," Modi tweeted. "The people of India deeply appreciate this gesture."